Quickly obtain Title Deeds for over 28 million properties throughout England and Wales. Land Registry Title Registers provide detailed property, house and land information, including ownership details, house price, title number, as well as leases, mortgages and covenants. 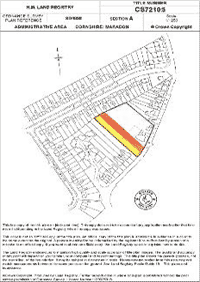 The Land Registry Title Plan displays an outline of the property and its surroundings, often with coloured markings indicating rights of way, shared access, land affected by covenants and the route of watercourses. Other online Land Registry documents comprise conveyancing deeds, historic copies of Title Registers, leases, common land, property boundaries, rights of way, insolvency and neighbourhood. Land Registry searches are the main source of information relating to home and land ownership, mortgages, charges, easements, restrictive covenants, property boundaries, rights of way, current and past ownerships and house prices. As a private and non-Government affiliated enterprise we are able to provide specialist and unique services in a professional, efficient and speedy manner both to individuals and to commercial organisations, and to operate a same-day service for the majority of our searches. Land Registry Title Registers, Title Plans and most other conveyancing searches are available to all members of the public, whether or not they own the property. Our online services are available to the general public, commercial, professional and public organisations throughout the day and night, 7 days a week. We aim to provide a fluid and simple process, leading the way with online property document provision, to help streamline conveyancing processes and make access to property title documents more simple for the property professional or home owner. We are an independent supplier of conveyancing searches and are not affiliated with the UK Government or HM Land Registry. We can obtain copies of Land Registry documents for any registered property, even where there is no postal address as is the case with fields, moorland, woodland, building plots, derelict buildings, waste sites, lanes, alleyways, rivers, lakes, ancient monuments and grass verges. We know how difficult it can be to find the documents you need and how much time and resources are wasted searching for property information. We provide a simple and easy way to obtain all of your property documents from one location, giving you peace of mind and the time to do the things you would rather be doing. 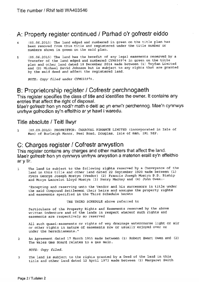 Most of the property in the UK is now registered, and the prime source of discovering the ownership details is to obtain a copy of the Title Register. 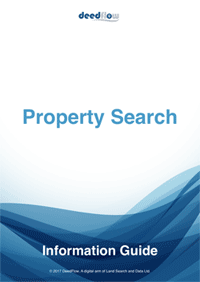 Property is identified by its address or title number. Where there is no postal address and the title number is unknown our unique Map search can be used to identify the land, however large it is. We provide searches to identify who your neighbours are, local education and leisure facilities, land contamination and other land risks, flooding, mining, utility routes, etc.